Posted on April 11, 2013	by Judah Gutwein, L.N.H.A. I’ve been brushing up on the hot button topic of re-hospitalizations and its impact on our industry. At Regency Nursing centers, we are at the forefront of addressing this evolving issue and we have implemented systems to limit our re-hospitalization rates. Our President has made it a focus of our organization to set up a system of procedures and protocol to tackle these issues in-house and the local hospitals are taking notice and expressing their appreciation for our efforts. 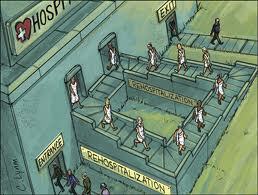 What is Re-hospitalization (in a nutshell)? This is an effort authorized by the Affordable Care Act, to get hospitals to pay more attention to ensuring that their patients receive the requisite care after they leave. Nearly 1 in 5 Medicare beneficiaries are readmitted to the hospital (post a discharge to a subacute rehabilitation facility) within a month. This is a problem for the hospitals because Medicare will penalize those hospitals whose instances of readmissions (with same diagnosis) within a 30 day window are deemed to be ‘too high’. These penalties have obviously captured the attention of hospitals, and they in turn seek to monitor the progress and recovery of their patients who are discharged to local subacute facilities. A facility with a re-hospitalization rate that is too high will be penalized by the hospital and receive fewer referrals. Hospitals’ traditional reluctance to tackle readmissions is based on Medicare’s payment system. Medicare will typically pay the hospitals a set fee for a patient’s stay, so the shorter the visit, the more revenue a hospital can keep. Hospitals also collect reimbursement when patients return. Until the new penalties took effect, hospitals had little incentive to make sure patients weren’t readmitted within a short period of time. Based on my own research, I do however have some reservations with this initiative. For one thing, I am concerned that in some instances hospitals deal with the pressure by discharging patients prematurely and before their acuity phase has truly passed. A premature discharge from the hospital, can force the subacute (accepting) rehab facility to send the patient back within the 30 day window and essentially get penalized for a problem they didn’t create. Some researchers have also complained that penalties do not take into consideration, the nuances of a patient’s specific clinical diagnosis and low income level (which may hamper their ability to secure proper follow up care and medicine). Finally, I have also noticed a trend whereby hospitals will sometimes keep a patient on ‘observation’ only without actually admitting them. My concern is that in some instances, perhaps said patient is sickly enough to warrant a full admission, but the hospitals may be reluctant because of a desire to avoid a possible (future) re-hospitalization issue and subsequent penalty. Much of this is still evolving and we are closely monitoring all changes so that we can remain at the top of the curve. This entry was posted in HealthCare News and tagged avoiding rehospitalization, information on rehospitalizations, rehospitalization, what is re-hospitalization?. Bookmark the permalink.